8 reasons why first-class airfare is so expensive varies between several different criteria, markets, and targeted customers. First-class plane tickets can cost as much as 70% more than economy airfare, and even more for international flights. Such a high price tag makes flying first class an unattainable dream for many travelers. It’s so expensive, in part, because it enables airlines to offer other tickets at a discount; it comes with coveted perks and pampering; and customers are willing to pay for it. First class has come a long way since the days when extra leg room was considered luxurious. From offering meals by Michelin-starred chefs to in-flight showers, today’s first-class experience offers so much more than it used to. One could call it a first-class hotel in the sky. But all that jet-set glamour comes at a steep cost — as much as a 70% increase in farescompared with economy, possibly even more if you’re flying internationally. Currently, an American Airlines economy flight from John F. Kennedy Airport in New York City to Heathrow Airport in the UK in July 2018 is $915. If you’re flying first class on the same airline, that cost increases to $5,407. Unless you’re savvy with your airline miles and points, this high price tag renders first class an unattainable dream for many passengers. As someone who hates being crammed like a sardine in a can for eight-plus hours but is far from being able to afford the ultimate upgrade — and has yet to master the art of nabbing a plane’s prime real estate for next to nothing— I can’t help questioning why first class has to be so out of reach. 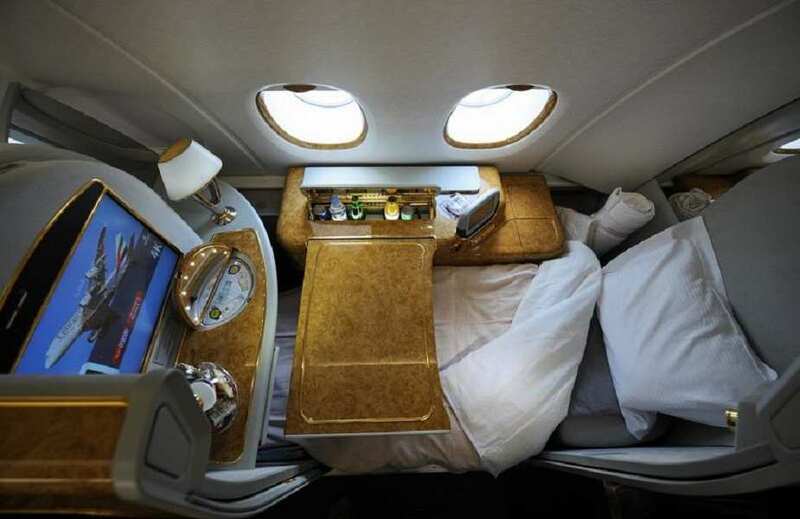 Here, eight reasons first class is so expensive. First class offers coveted perks and pampering. One of the biggest appeals of first class is also why it’s so expensive: the perks. Airplanes have notoriously bad food, but it’s a different story in first class, where menus of fine dining quality and dishes created by Michelin-starred chefs are often available — think Mahi-Mahi with lemon herb sauce, grilled asparagus, and jasmine rice. Some airlines are even said to serve Ben & Jerry’s ice cream sundaes. Rumor has it that American Airlines saved an estimated $40,000 by removing one olive in each salad served in first class. And once passengers are fueled up on quality food, they’re able to slip into a food coma with a flat bed, bedding, and turn-down service. If that’s not enough to catch some Zzz’s, airlines also provide pajamas and eye masks. Other possible perks include a private TV screen; in-flight WiFi; goodies, from expensive gift bags to knitted socks; and showers. The Emirates A380 has two shower spas, complete with heated floors. First class provides exclusive access in the airport. Special treatment isn’t confined to the airplane, though. First-class passengers also have special access to first-class airport lounges before and after flights, where they can grab a drink pre-flight or take a shower upon arrival. Some lounges even offer free mani-pedis. As if that’s not enough, some airlines even shuttle passengers to their connecting flight in a Porsche or Mercedes. First class banks on passengers’ willingness to pay. “At a certain level of wealth, price doesn’t make much difference,” writes one Quora user who has flown in first class. Some are willing to pay a premium for the convenience of first class. A family with a toddler or a businessman who can get work done on the plane and land ready for a meeting are both better off leaving the plane refreshed and less stressed with minimal jet lag. 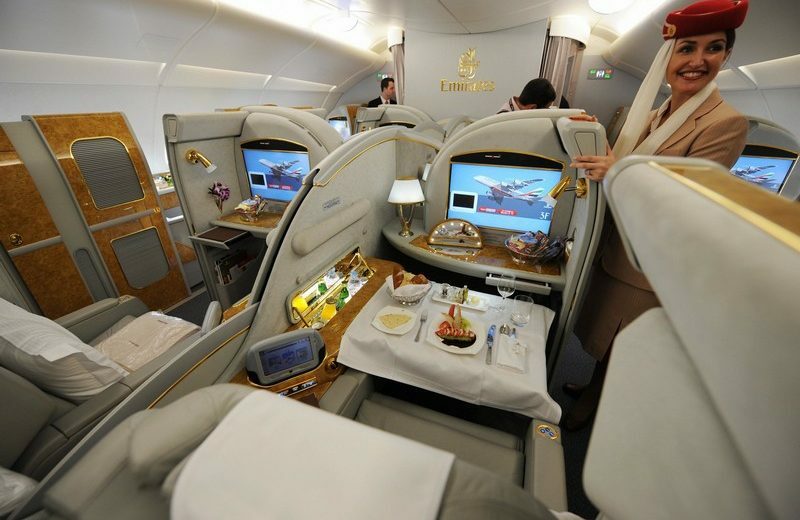 First-class prices allow airlines to discount tickets and offer promotions. A major airline executive told Schlappig that airlines don’t expect anyone to pay full fare for first class; the fare is purposely set high so it can be discounted. But more airlines are beginning to extend the discounts beyond the corporate setting, he added. Swiss and Air France recently offered discounts to passengers willing to pay for first class if the deal is reasonable enough. The latter offered a round-trip first-class flight between London and Hong Kong via Paris for $4,600 — much lower than $20,000 first-class fares elsewhere. Some airlines also have promotions that offer free upgrades to first class when paying for a full- fare business-class ticket. People aren’t actually paying for first class. Because larger companies have contracts or negotiated fares for first-class employee travel, many people aren’t paying for their tickets, whether they’re an employee or being sponsored. “At my last job, VPs and above were authorized to fly first class on international routes,” writes a United million mile flyer who used frequent flier miles to buy a first-class ticket to Melbourne, Australia — yet another way people don’t actually pay for first class. First class is perceived as a luxury good. First class creates a sense of exclusivity and high prices are necessary to maintain luxurious standards. “When someone does sit in first class, they feel like they’re getting outsized value, whether in the form of an upgrade, award, or discounted first-class ticket,” writes Schlappig. Other associated costs have increased for first class. Ticket prices today for both first class and economy are higher than they were 20 years ago because other associated costs have increased. In 1996, airline fuel cost 55 cents per gallon. As of April 2018, it cost $2.02 per gallon. “Airlines can’t absorb all of that increase, so they pass some of that on to the consumer, leading to higher fares,” writes travel blogger Nomadic Matt, who added that airline taxes and security fees have also increased, hiking up the base fare. First class takes up a lot of real estate. Seats are up to 32 inches wide with a max pitch of 92 inches in first class, according to travel site Momondo. This helps give the passenger more privacy and comfort. As one Quora user explains: On long-haul planes, a first-class seat takes up as much real estate as four to six economy seats, so it should be sold at least four to six times the price or more, considering the competition for economy. The perks are there to help justify the price difference to the customer. And that’s not to mention first-class suites — yes, they exist. Etihad’s A380 has the option of three different first-class suites, including a three-room suite with a living room, double-bed bedroom, and private bathroom with a shower. It’s all yours for a $32,000 one-way ticket between New York and Abu Dhabi, reports Momondo. The location of first class is also the most convenient for boarding and deplaning.